If your target market includes Cub fans, reach your audience directly and economically with highly targeted advertising on the CubHub.net fan site & blog. We use and continually maintain the latest SEO (search engine optimization) methods to make our site visible and find-able to those who search through Google, Yahoo and Bing. 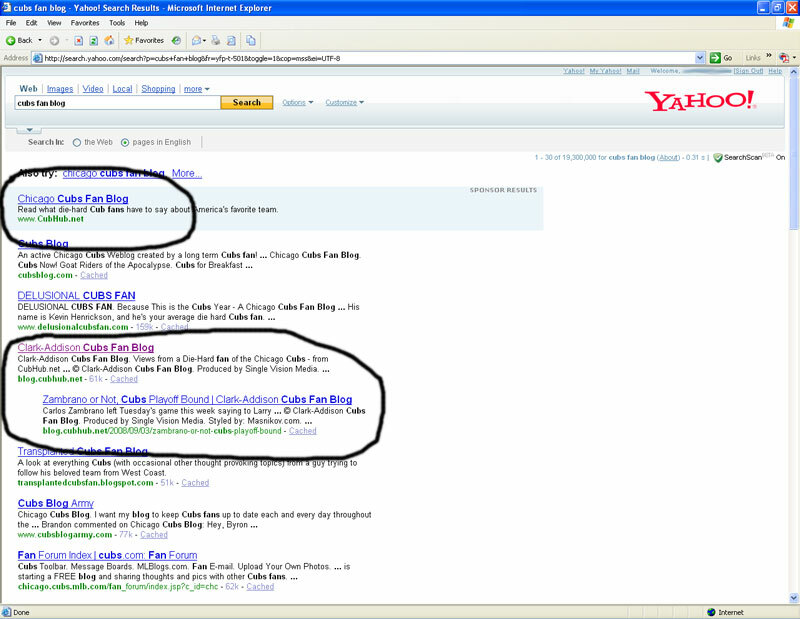 Here is an example of both paid and optimized search results for CubHub.net. We place PPC (pay per click) text advertising, triggered by certain keywords and phrases typed into Google, Yahoo, and Bing as well as running ad campaigns on Facebook and other social media. As CubHub.net is a fan site, we devote much of the ad dollars raised through your sponsorship to additional paid-placement ad campaigns. For this reason, the more sponsors we get, the more all sponsors benefit from traffic. Our goal is to build site readership and loyalty, not strictly to make money. The blog on CubHub.net is syndicated to many other websites, including major media sites such as Reuters, and the Chicago Sun-Times. Here are examples of our blog posts re-published on other sites. Additionally, all posts are automatically fed to Ballhype, Alltop, SportsBlogs.org, and to our subscriber base in Facebook, RSS, and via email. According to Sports Business Daily, the average fan of major league baseball is 35-54 year old white male that earns $50-75,000 per year...does this fit your target market profile? More info here: http://www.sportsbusinessdaily.com/article/119720 If you want to reach Cubs fans, support this site by advertising on CubHub.net! Next step is to contact us today! Join the likes of Stub Hub tickets, CBS Channel 2 TV Chicago, Amazon.com, iTunes and others: advertise on CubHub.net!